Trade the Fundamentals Okane’s Way! Everyone Can Do It! Tired of indicators you can’t understand? Complex strategies that look great when you back test them but when you try them live they never deliver the promised results? Are your eyes red from reading the charts? Then you are the perfect candidate to try out news trading – Okane’s way! I like to keep things as simple as possible and so is my fundamental strategy. You don’t need that much practice once you understand what to look for and where to look for it. What are Fundamentals and How to Use Them? Fundamentals are news that affect a certain asset in either a positive or a negative way. We can take advantage of these news announcements regardless of what kind of effect they have on the asset. For example, if the unemployment numbers in the USA increase, it has a negative effect on the US dollar. Depending on which currency pair we are trading there is a way to make money on it. Regardless of the currency pair you are trading, always keep this simple rule in mind: The base of the pair is always the one on the left, if the base gains strength price on the charts go up and if the second pair gains strength price on the charts should go down. It’s important to have a reliable news source that provides us with the correct fundamental analysis that we can base our trades on! I use Forexfactory.com. Example: GBP/JPY – If announced news are good for JPY, GBP/JPY should go down. USD/CHF – If announced news are good for USD, USD/CHF should go up. Prior to a news release, I go to Forexfactory.com. It speeds things up to set your settings in advance so you don’t have to do it each time! The two settings are in the top corner, Time and Filter. See the picture below and follow the 3 steps and bookmark the site when you are done for easy future access. Step 1. Click the “filter” under the search box, Step 2. Make sure only red and orange “folders” are checked because they have the highest impact on the assets. Choose only the currencies you are interested in. I only trade EUR/USD so I have only checked the boxes for EUR and USD as you can see. Apply the filter and go back to the main site. Click the on the displayed time next to the search box. Set up your desired time and save the settings. Now click on the tab “Calendar” and bookmark forexfactory.com. *You don’t have to register to the site! Great, now watch this short video where I take two trades based on the news and I will explain what I did there! 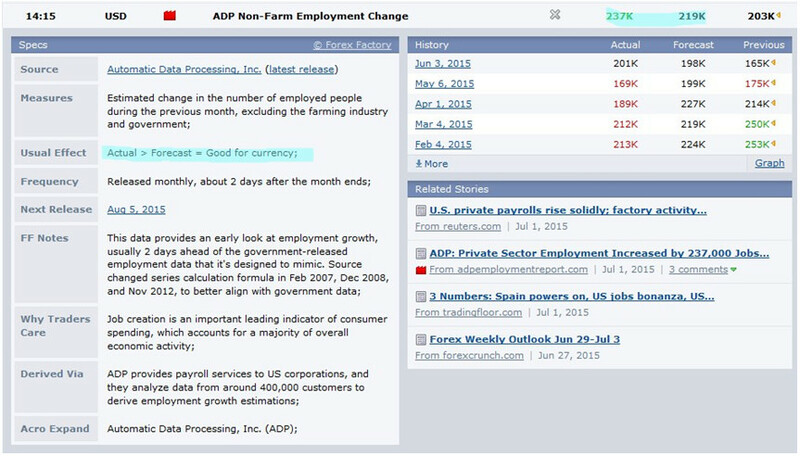 In the video you see me first clicking the green refresh button because time was exactly 14:15 and “ADP Non-Farm Employment” Change was just going to be released. I do this so I can see the news as fast as possible. Notice that this news announcement was marked red under where it says “impact”, this means we expect a volatile move on the charts. Seconds later I see that the announced number (actual) is 237K in green color, meaning it’s higher than the forecast number 219K. I immediately placed two trades, one put option using the KIKO feature and one regular put option with a 10 minute expiry. Why put you might ask? Where it says “usual effect”, it is stated that if: Actual is > (bigger than) Forecast = “Good for Currency”. It means that if the announced number is bigger than the forecast number it is good for the US dollar! In this case we got 237K which is in fact bigger than the forecast 219K so the US dollar strengthened against the Euro. Since I was trading EUR/USD where the Euro is the base pair it was only logical to take a put option. Always look at the specifics for each high or medium impact news before planning your trade! Each outcome and expected usual effect differs from news to news so always read the details. It helps to be prepared so you know how to act on the numbers you see at the time of the announcement. The first trade to end in the money was the 10 minute put option. The KIKO took roughly an hour to finish ITM and I took this trade to show you that if you don’t know how to set an expiry you can still win by simply choosing the correct direction! As you know from the explanation above, we expected a HIGH impact. Therefore, selecting the High Span KIKO and going low was a pretty safe choice. If your broker does not offer similar features, I would suggest taking a ten minute expiry and an hourly expiry with a bit higher investment on the latter. You should also know that your best shot is when the news is expected to have a high impact, the medium impact events are not always safe to bet on. Conclusion – It Doesn’t Take a Genius! There you have it! All you need to do is to go to any news site you prefer and read the info on the next high impact announcement, I prefer ForexFactory.com. If it is expected to have a good effect on the currency you like to trade wait for the actual numbers to get released to place your trades. Choose direction based on whether the currency pair should rise or fall, it doesn’t take a genius!